Diverticulitis symptoms will be suffered by at least 30% of people who have diverticula pouches in their large intestine. Diverticulosis or the formation of pouches of intestinal lining which push through weak spots in the muscle wall of the colon is very common as we age, with 50-70% of all eighty year olds having these little bubble-like sacs on the outside of their large intestine. 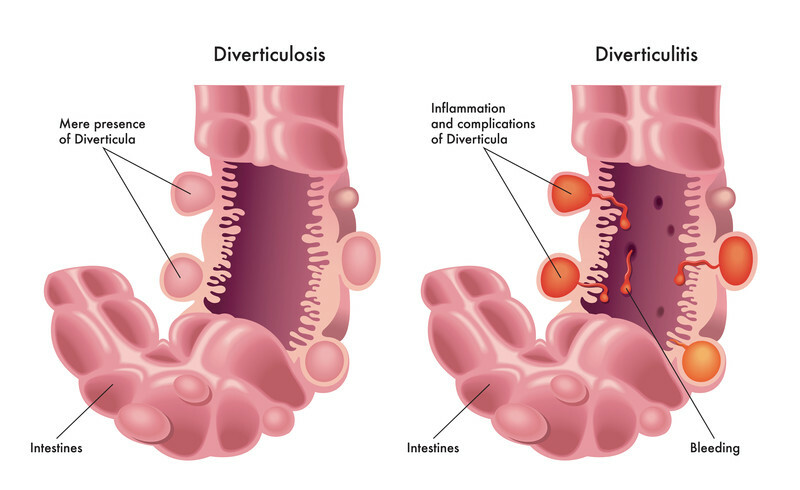 What is the Difference Between Diverticulitis and Diverticulosis? Diverticulosis just means the formation of the sacs or pouches in the large intestine. Most people have no symptoms of diverticulosis (asymptomatic diverticulosis) and are not even aware that they have diverticula pouches. Approximately twenty five percent of these people have some symptoms (symptomatic diverticulosis). The word diverticulitis is used when the diverticula become inflamed leading to worse symptoms. The ending 'itis' means inflammation. The symptoms of diverticulosis are lower abdominal pain (left sided in Caucasians, right sided in Asians), constipation, diarrhea, bleeding, wind and bloating. The symptoms tend to come and go. These same symptoms will still be present in diverticulitis but they will be worse and more persistent. Caucasian people usually feel the pain and tenderness on the left hand side of the lower abdomen because they tend to have diverticula in the sigmoid colon. Asian people tend to have diverticula in the ascending colon and so feel pain on the right. These differences are probably genetically inherited. If you develop these diverticulitis symptoms then please contact a medical professional immediately as treatment will be needed with antibiotics. If treatment is started quickly then the risk of diverticulitis complications happening is reduced. These symptoms may be indicating that you have diverticulitis especially if you already have a diagnosis of diverticular disease but it is important to remember that they could be indicating other things. You may appear to have the signs of diverticulitis but diagnosing the problem if you have abdominal pain is not easy and you should seek medical attention. Diverticulitis complications arise in about 1 in 5 people with signs of diverticulitis but you are more at risk if you are under 50. An abscess is the most common complication following on from diverticulitis. It is a walled off collection of pus which has spread from the inflamed and infected diverticula pouch to other areas of the body outside the bowel wall. It will usually cause tenderness and swelling in the abdomen with pronounced abdominal pain. Small ones can be treated with antibiotics but usually they will have to be drained surgically. Fistulas are tunnel-like structures between two parts of the body making an abnormal connection which should not be there. When two parts of the body touch each other, if they are inflamed they can be temporarily glued together. When they heal up a fistula connection can remain between them. This is bad news because it allows bacteria to travel from one area to another. This is most often between the bowel and the bladder and is more common in men than women.This will lead to bladder infections. Why Have I Got Urinary Problems? It may be difficult to believe that urinary problems can be one of the diverticulitis symptoms and complications as they are not directly involved with the bowel. It can happen however because the inflamed part of the bowel can be in contact with the bladder making passing water more painful and causing you to go more often. As mentioned above urine infections can be a sign that a fistula has formed between the bladder and the bowel. It doesn't happen very often but occasionally an infected diverticulum can split and the infected material will be spilled into the abdomen. This will cause an infection of the lining of the abdomen known as peritonitis. This can be life threatening and immediate treatment with antibiotics is needed. Normally this complication of diverticulitis will require a hospital stay and in some cases surgery to drain pus away. The symptoms are similar to diverticulitis symptoms but you will feel a lot worse. The abdominal pain will be severe, there will be vomiting, you will pass little or no urine and your heat beat will be rapid. Usually your abdomen will be swollen and you will have a fever of 38 degrees (100.4F) or above. Diverticulitis symptoms can lead to scarring over time. Repeated episodes of inflammation in the large intestine can cause the bowel to narrow (a stricture) and scars to form. This can cause the bowel to become obstructed. The bowels will stop working as the stools will not be able to get past the stricture. Indications include having no bowel movements or passing any gas. Other symptoms include severe abdominal pain, nausea and vomiting. Obstruction can lead to rupture of the bowel and peritonitis if it is not treated promptly. Obstruction following diverticulitis is rare and sometimes the blockage is only partial allowing time for surgery to correct it, however, it is something which should be thought about if you have long standing diverticulitis symptoms and your pain gets more severe, you stop opening your bowels and you have nausea or vomiting. If you have a diagnosis of diverticulosis and your symptoms suddenly worsen and you feel ill with a fever then you this could be signs of diverticulitis starting or one of its complications. You should seek medical attention quickly so that treatment can start as soon as possible. Outpatient treatment with antibiotics is possible but sometimes hospital admission is required. Be aware that the diverticulitis symptoms which have been listed in this article could be an indication of other problems such as appendicitis or Crohn's disease for example so it is important to get a diagnosis from a qualified medical professional. If you have a diagnosis or the symptoms of diverticulosis, for more information about how to prevent it progressing to diverticulitis and also for information about diverticular bleeding and diverticulitis treatment please see below. Do you have abdominal pain, a build up of gas and you see blood when you go to the bathroom? You might have diverticular disease. Some treatments can happen in the comfort of your own home but some need to take place in a medical facility. Read about the different options.